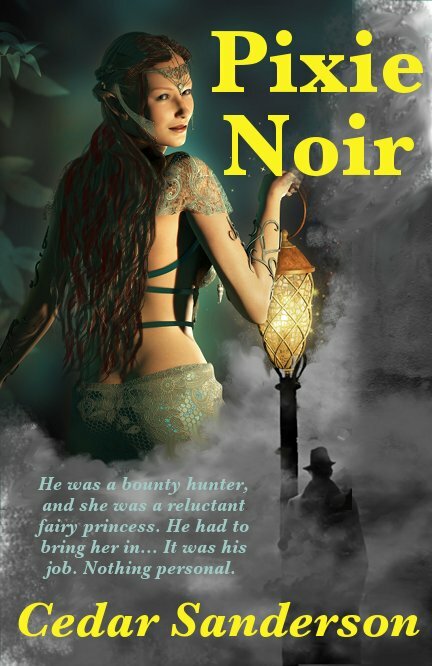 Part noir, part urban fantasy, Cedar Sanderson’s Pixie Noir fun little story about the darker side of fairies that nobody ever wanted to tell you about. Lom is a pixie tasked at retrieving one of the few surviving human/fairie hybrid princesses to Court in order for the King to chose his consort. Bella Traycroft is living in the rough wilderness of Alaska, which makes his journey even more difficult as he battles the frigid Alaska spring, hoping to convince Bella to accompany him back to Underhill, the magical lands of all fae folk. Along the way, Lom has to protect her from trolls, ogres, and any others who may not want the princess to arrive in court and be recognized. Oh, and he has to teach her magic along the way. His life is tough. They have a few teacher/student bonding moments, especially when they discuss the dangers of Lom being a pixie bounty hunter and when he tries to teach her magic initially. They begin to bond in an unpredictable way, which could potentially lead to troubling developments down the road. Pixie Noir is fun and breezy, though with a pacing problem that can detract a bit from the reading experience, it is a pleasant read overall. Some of the scene changes were jerky, including one in the beginning which completely threw me out of the story for a bit until I realized what was going on, but fortunately that only happened twice throughout the book. The book is written with Lom being the point of view character (for the most part) and does a fairly good job at showing the conflicting nature of the pixie and his charge/princess. I did have one fundamental problem with the book early on, and it involved the main character. It felt at times that the author tried too hard to make him rakish and rogue-like, instead of focusing on developing him as a character overall. I found myself thinking (only in the early part of the book, mind you — once they get to Underhill, it’s an entirely different Lom) that if Lom had been a female pixie, the story might have worked better at some points. Overall, though, it worked in the end for both the reader and the author. Overall, a fun book. I would recommend picking up the ebook. This entry was posted on February 3, 2014, 11:52 am and is filed under Book Review. You can follow any responses to this entry through RSS 2.0. You can leave a response, or trackback from your own site.